Hi, so basically im a 22 year old female and i am completely fkin fed up of life I HATE IT AND I HATE EVERYONE IN IT. and all i can think about is killing myself lately??? it just seems there is no point in me living anymore. is there some sort of paat or kirtan or ANYTHING that can help me feel better!? I dnt rlly know what im suppose to listen too, religion is like my last resort rn cos MAYBE GOD CAN FRICKEN HELP ME. i feel so alone and hopeless and i have like 5839 meltdowns a day. THANK U FOR READING THIS AND I RLLY APPRECIATE ANY HELP TBH. Give sikhi dharam a chance and see if that helps you. I would encourage you to start with Katha first. Share if it helps you or not. Make religion your first resort and everything will start getting better. Read the sikh rehat and maryada/code of conduct, it will give you guidance and structure in your life. Sikhi gives you a purpose. Most people on earth are waking around with no structure guidance or purpose. A few years back I too hated living and had no guidance or purpose, I was just doing things for the sake of doing things, waking up and working without thinking. Sikhi then gives you guidance and structure, it gives you a purpose and tells you why you are. If you did it, It would be millions times worse in hell. Get therapy, you need it asap. Try the IAPT service if youre in the UK, its free. First of all stop worrying . You are young and have your whole life ahead of you. Life is a precious gift. Cherish it. Dont do what you are thinking about. You are at a low stage now but trust things will get better. I dont know your personal circumstances. But I am guessing you may have some mind health issues such as anxiety or depression. I am guessing here but something to do with drug alcohol substance addiction or family/ career issues that maybe causing it. Would you care to elaborate on what it is that is making you feel this way? If not it is perfectly okay if you dont want to discuss it. But it would help as we would be able to make suggestions based on what you are going through at this present time. Exercise, be more active, eat better healthy food. a lack of all the above can lead to feeling unhealthy both physically and mentally. What is it that you are so fed up about that makes you feel like this? Please don't think of bad thoughts. Preetam Pyare Waheguru ji is Dayaavan and Kirpaal and he loves you. Remember the purpose of this life is to meet our beloved by singing his Kirtan and Japping his Naam which is received when we give our heads to Panj Pyare and are blessed by the Guru with Amrit Di Daat. 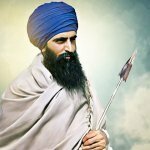 Listen to Sukhmani Sahib. Professor Satnam Singh Sethi's voice is quite calm and soothing. Listen along with the meaning and your Dukh will go away. Maharaj will surely help you. So sister ji we are all the children of Waheguru. He loves us. You have a purpose and a life to live. We all love you as a sister and pray to Waheguru ji that he will help you out. There are subtitles in English if you can't understand Punjabi. If your in the UK then there is 'Sikh Your Mind', a group who help people who may need support. Im a guy and I have read about there work, generally that group is lead by sikh women. Its sounds like there may be a number of issues, obviously the advice on here will be based on many assumptions. Firstly reflect honestly on your mental well being, remember there is no shame to seek assistance. Review your environment, obviously if theres any harm to you physically or emotionally then that needs immediate action. In othercases its about having some time out and space to think. And slowly changing your environment or dealing with each issue. Go to the gurdwara, try to make a regular attendance, where you can try to take time out and pray. Early morning is a good time especially if you find during the day your mind is unsettled. Join a community volunteering group or get involved with some seva at the gurdwara. Speak to a counsellor, if you go to the gp they will help you and refer you. If you need to speak to someone asap then call the sikh awareness hotline or samaritans. They will guide you. maybe change your outlook/attitude. try and see the good/beauty around you rather than the bad around you. if there seems no point in living, how does that justify suicide? just live without a point (!). also, you have life and health. use it for something productive. why don't you start Naam Simran? at least you will have a purpose. just remember God all day, no matter what. make that your purpose. merely reciting some Paath is not going to help. you need to have faith in God and start seeing yourself as His sevak. there its not the situation that you find yourself in that is important, only how you are reacting to it. have some humility. just because you desires are not fulfilled or things don't go the way you want them to, does not mean you should contemplate suicide. don't be so stupid.